After doing last year I signed up again as soon as the entries were open as it seemed like a good idea. Paul and myself arrived in Llanberis to cloudy, misty and damp weather. It certainly wasn’t going to be a day for seeing the views of the mountain and surrounding area. We collected our numbers and then waited for Lee and family, Dave & Amy before heading to the café for breakfast. The race starts at noon so we had plenty of preparation time as we had got there for 09.30am. To be honest I wasn’t feeling great today and had made more than the usual pre-race toilet trips but once there you just have to man up and get on with it. Three of the race committee had passed away during the last year so we had a minutes applause prior to the start (I have to admit I prefer a minutes silence as it seems more appropriate in the time of reflection). And were off. 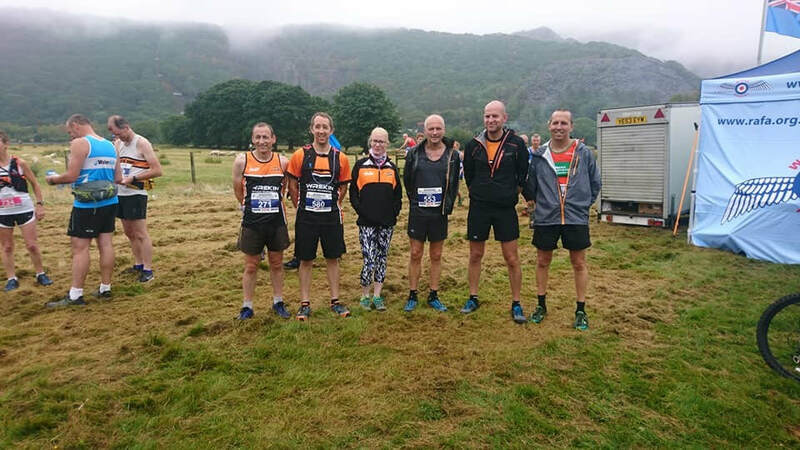 Despite the weather being damp vests were ok for the run as it didn’t take long to warm up with the first half mile/mile being on tarmac as you head from the start to THE FIRST REAL HILL. This is a 25% gradient slope. Now a few weeks previously I had walked up Snowdon and In that walk had been reviewing/planning a strategy for the race. It involved a run/walk policy at critical points. Now the elite run all the way up it, amazing to see. 1st point of plan was to walk during part of this hill so I stuck to the plan. People go by you but are using more energy early in the race. So all the way to the top I remembered my plan and the points I needed to walk. I reached the top 3 minutes quicker than last year and with my only aim for the race being to be quicker than last year looked good. Now this race is actually TWO RACE’S WITHIN ONE. First is the up to which some are better than others at. The second is the down where again some are better than others. I don’t really like the down bit and that showed as you come down trying not to slip/trip over and others just fly by you. As I neared the bottom of the rough track I came alongside Lee who hates the down more than me. I went past and then down to tarmac again. Running down this is definitely harder than running up it as your quads just take a right battering. As we hit the bottom of the slope Lee came alongside me. Lee then encouraged me to keep going but I was absolutely hanging on the edge of exhaustion. We ran to the finish with my legs like jelly. It is a great event if not one of the hardest ones I have done. Like I say its two races in one. T-Shirt and a coaster for your pain. Everyone else ran brilliantly on the day from the experienced ones to the newbies.